It is quite close to being called a bucolic setup where I live in an otherwise busy city which is home to many call-centres and multinational companies. I am barely five minutes away (car drive) from a popular road which is chock-full of malls on both its sides. Yet, as soon as I am back to my enclave, I am surrounded by trees and greeted by variegated tweets of the birds – some shrill, some soothing, some musical and some of them sound so impatient! Oh yes, then the peacocks and the peahens. They have a baritone! You can hear the human and motor sounds too but they are subdued by the sounds of these birds. Living in harmony with them (the birds, the bees and the other animals) often clashes with living in harmony with my neighbours (some of them). And then the dilemma arises. Who do you side? As much as I like to feed stray dogs I cannot let them in in my three-floor apartment as the neighbours on the other floors get peeved. The dogs have been very understanding in the past except for one who with one foot in her grave already chose to sit on the marble floor of our stairs or on the porch to escape the scorching summers. I chose to ignore her as this allowed her to sit there for more time until I could hear my neighbour screaming and shouting and even kicking her out of the gate. I didn’t put up a fight. Teaching compassion to a full-grown adult, who also came across as a nuisance otherwise, was like hitting your head against a brick wall. I also overheard him saying once that if I was so fond of the dog I should either live in an independent bungalow or adopt the dog and allow it inside my house. Maybe he had a point. Unfortunately I couldn’t do either of them. I chose to remain passive. The dog died one day and the saga got over. In fact the nuisance neighbour also shifted from there . And then history repeated. Recently, a new stray dog decided to come right up to our door (see picture; first image from top) and sit there. Only this time, I did not ignore its presence. I drove it away – nice and loud. I drove it away the next day too. I perhaps did it because I wanted the neighbours not to react like their predecessor. I didn’t want to get into an unnecessary argument. I had perhaps matured with time and experience, or had I become more timid and even hypocritical? And then came in the bees – a swarm of them who decided to make not one but two beehives right outside our floor on the roof. The beehives were becoming bigger every day and so was the cause of worry for everyone around. I remember being stung by a bee two years ago. I was asked to get rid of them which I delegated to my house-helper. He came in one fine evening when it was dark and with a big stick demolished both the hives. I could see the bees feeling lost the next morning. They were clinging on to the fallen hives on the floor (see picture; 2nd image from top). My guilt only went a notch up when I happened to read a few days later that the beehives don’t do any harm and should be allowed to thrive. Should I have ignored them in the first place? I believe there are many passive people like me who choose the easier path perhaps to live in peace. Passive pacifists? It takes a lot to be an activist (for animals or any cause)- both mentally and physically since it can drain you completely. However I am happy that the activists do exist and unknowingly they fulfill another role – to put people like me to shame who wish to take a stand but choose not to. And one such activist happens to live across the road. 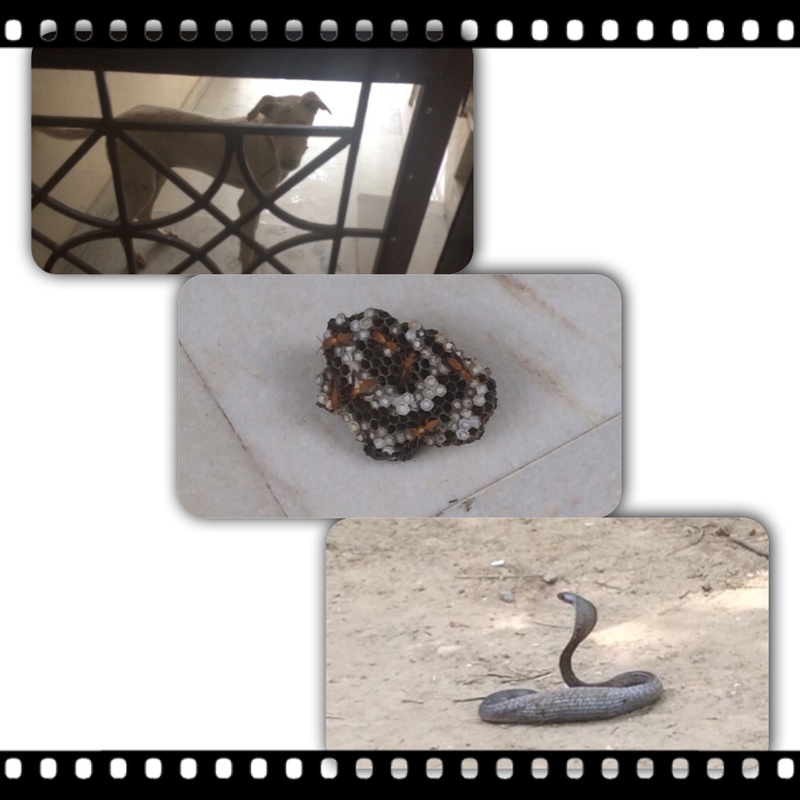 Two Sundays ago, a snake, cobra to be precise, paid a visit to our lane (see picture; last in the collage). It was an unusual sighting though there had been instances of snake-spotting long time ago. This cobra had got stuck in a drain pipe. Presumably due to overeating. (You can see its bulged tummy in the picture…mouse dish?) This led to a brouhaha in the lane. Everyone started gathering near the drain pipe. Nobody dared to go any closer lest the cobra got out of the pipe and stung its venom out on someone. At that point nobody knew it was stuck there. You could just see its tail. Had it not been for my animal-activist neighbour, the cobra would have been, after sometime, beaten to death by the onlookers with sticks and stones. She called up the wildlife helpline and a snake-catcher reached in no time. He managed to rescue the snake and take it back with him where he said the snake would be checked by a doctor and then released in the wild. My neighbour, my hero, I wonder if she has any dilemmas in life at all?